Driven by acoustic guitar, adult contemporary Christian music that is distinctly Catholic. Deeply touching lyrics and extremely memorable melodies that will inspire the listener to prayer and reflection. 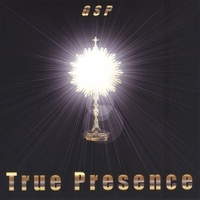 GSP plays CCM: Contemporary Christian Music written for an audience of One. But, luckily, you get to listen in too! They are a group of musicians, based in St. Louis, who give their time and talents in order to help spread the great message of the gospel, and further the teachings of the Catholic church. Maybe it should be said that they play CCCM: Contemporary Christian Catholic Music. Their music is designed to inspire prayer, reflection, instruction and joy, and to move the listener closer to Jesus Christ. These songs are are not traditional “Catholic” music. It’s definitely not Gregorian chant, and you will hear no pipe organs. Their folk-rock music is driven primarily by acoustic guitar. And yet, it reaches deep to the roots of the Catholic faith in such songs as “Anima Christi” and “True Presence (Not Just Wine)”. The gentle and poignant track, “Silent Voice” is an anthem for the unborn, and the driving “Hangin’ By A Thread” and “Prayer Of Saint Augustine” should set your feet to dancin’. Their vocal stylings cover a wide range since they have both male and female vocalists that can lead a song from earth to heaven. And their lyrics seem truly inspired by the Holy Spirit. Hopefully, the Spirit will inspire you too as you listen to this music. Some selections have been featured on EWTN radio and on EWTN’s “Catholic Jukebox” program. Check out their NEW CD WANTED!!! Biblically correct, faithful to and illuminating about our Catholic heritage, classic prayer in a contemporary setting, a fresh approach. Silent Voice could easily be the pro-life anthem. All the lyrics are wonderfully meditative poetry. The music draws one in – to an experience of the holy. Timeless. Your music never gets old. When is your next CD coming out? My husband & I were spiritually touched by these songs. The words are definitely inspired by the Holy Spirit. Their voices blend perfectly along with the musical instruments. It's easy to meditate on each song. Relax & allow the Holy Spirit to touch your life. The combination of compelling music and powerful, meaningful lyrics keeps me returning to this CD. I find myself singing fragments throughout the day. Real messages of faith and grace are contained here. This CD provokes thought and helps you examine your life in light of your faith...a gifted explanation of God's presence every day! The songs in True Presence truly touch the heart and soul of Catholism. My wife and I have listened to the tape a number of times now including while traveling. We have enjoyed it so much that we loaned it to one of our children to enjoy while diving to work. We have ordered another one--make that two! Fr. Frank Pavone should use the song of a Silent Voice for Priests for Life.